For my previous blogpost I focused on the history of the campus’s hospitals, culminating in our present day Olin Health Center. While students may pass by the building everyday few take time to note the dozen sculpture reliefs adorning the South entrance or realize the cultural legacy of these works of art. Amidst the poverty of the Great Depression, President Roosevelt commissioned the Work Projects Administration (WPA) as part of his New Deal program. 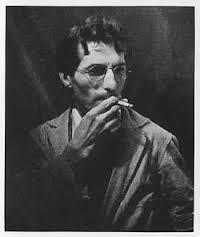 Among the WPA’s actions was to hire out of work artists to sculpt and paint public works of art. Many examples of this art movement cans still be found on the campus of MSU, perhaps most notably being the sculptures of Samuel Cashwan. The Russian born Samuel Cashwan was born around 1900 near the city of Kiev. As a child he immigrated with his parents to New York, before finding his way to Detroit. Cashwan received his training as a sculptor at the Architectural League in New York and under the tutelage of the acclaimed sculptor Antoine Bourdelle in Paris. When Cashwan returned to Detroit in 1927, he brought with him a style heavily influenced by classical Romanesque sculpture. Later on his life Cashwan would add Hindu to his list of influences. Cashwan believed that sculptor had a special place in modern society and each artist should strive to find his or her own unique style, rather than follow a prescribed formula for success. In a statement for a 1942 exhibit of his work at the Museum of Modern Art, Cashwan laid out his thoughts on the future of sculpture. 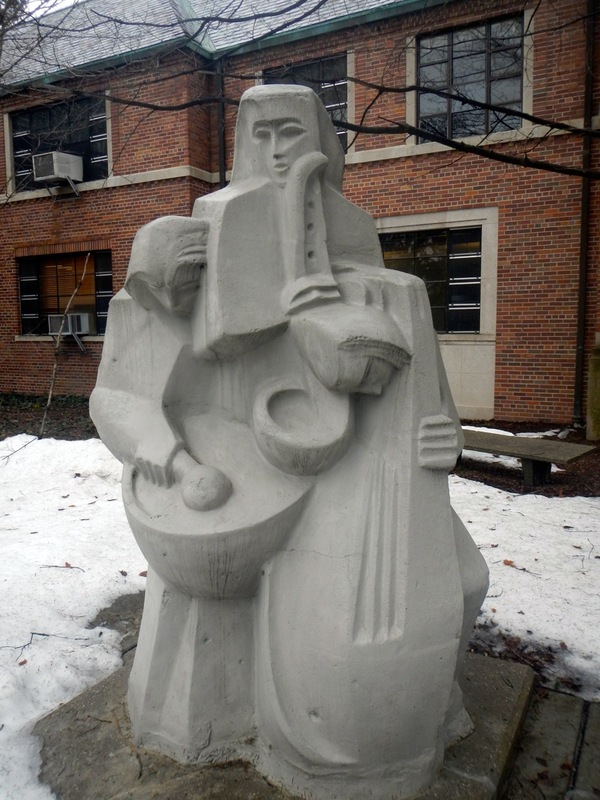 Cashwan was able to fulfill part of this vision when he became the sculptor supervisor for the WPA Art Program in Michigan. Beginning in 1935, Cashwan would begin installing sculptural elements across MSU’s campus. 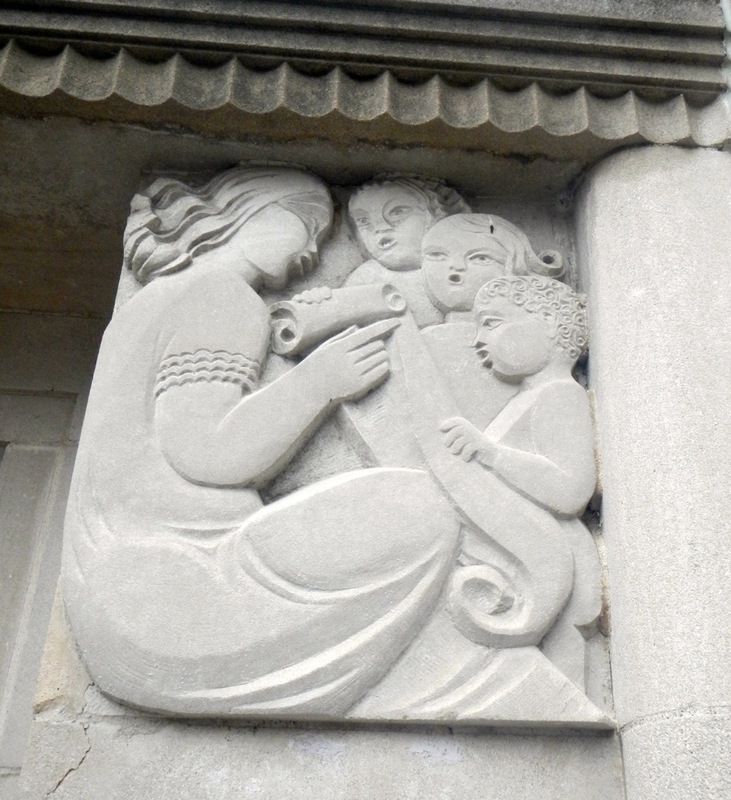 The Olin Health Center’s limestone reliefs feature classical imagery of health and healing. Panacea and Hygeia, the Greek gods of health, adorn the entry’s lintel, while the two flanking pilasters depict figures representative of the evolution of medicine through time. Traveling West from Olin, one can find another one of Cashwan’s sculptures at the Abbot Road entrance to campus. The Abbot Road Entry Marker was a gift of the Class of 1938 to welcome visitors as they entered the college. The column depicts a man and a woman with a horse and sheaf of wheat, harkening back to our heritage as an agricultural college. Moving into West Circle one can find two further examples of Cashwan’s artistry at the Music Building. The South entrance of the building features music themed Art Deco limestone reliefs. Near the entryway is the transplanted Three Musicians statue. Featuring a bass player, drummer, and saxophonist the statue was a gift from the Class of 1937. Originally the statue was part of a group of sculptures that flanked the MSU Band Shell. The statue was moved to its present site with the destruction of the Shell. The WPA left a lasting mark on the architectural and artistic landscape of America, and helped launch the careers of many skilled artists. 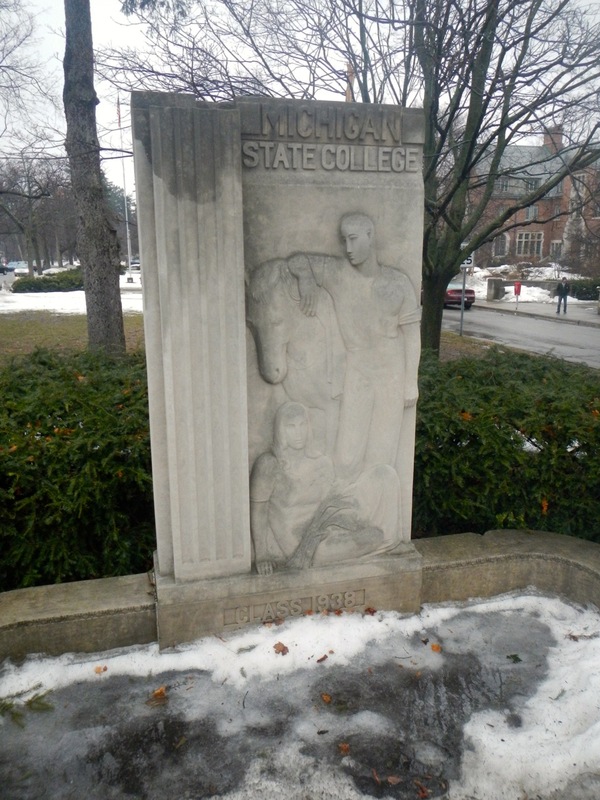 Cashwan spoke of the WPA as, “The greatest good a sculptor can perform is to create, not for a museum or a private collection, but for the common meeting places of men, to enhance and ennoble everyday life.” Samuel Cashwan would die in 1988, but his work remains a cherished part of the cultural landscape of MSU. So the next time you visit Olin for a checkup or pass by the Music Building, remember that such works of art were specifically created for the enjoyment of students like us. Miller, Dorothy C.-1942 Americans 1942. The Museum of Modern Art, New York. I am a School Board trustee of Lincoln Consolidated Schools. In 1938 Mr. Cashwan was contracted to design and install a statue of Abraham Lincoln with WPA funds to be placed at the School grounds on the anniversary of his death and to provide the only local monument to the local rural community. It was unveiled in 1938 with a presentation delegation from all over the state. Currently, I am on a school ad hoc committee to raise funds to help restore the state at this time. The statue celebrated its 75 anniversary and is in of some preservation efforts as it is sinking into the ground to A point of possibly tipping. Additionally, a major road expansion is being planned to occur adjacent to the current site which may require the statue to be relocated at a new point on the school grounds. We have already raised almost 7,000 in private donations and have received support to help clean the statue from a local society. However we are in need of raising additional funds within the year to keep the project going ahead of the current near by road construction. This a priceless piece of local WPA art that has a Smithsonian Reference number and is listed as a piece important to preserve in the State of Michigan. Currently, the school cannot provide any funds for assistance in preservation of the statue because we are in a deficit situation with the State of Michigan. Can you assist us in developing preservation funds for our project.